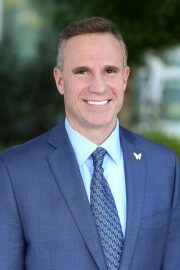 Steve Garske, PhD, joined Children's Hospital Los Angeles as senior vice president and chief information officer in October 2016. He oversees information systems and technology to carry out the clinical, research and academic goals of the institution. Steve has a decade of experience as a CIO and more than two decades in health care information technology. He served as the chief information officer for Verity Health System, a health care organization with 1,650 inpatient beds in six hospitals in the Los Angeles, San Jose and San Francisco regions. There he developed a three-year strategic plan for information technology, launched the replacement of the existing server infrastructure and oversaw the system’s eight electronic health records systems. Prior to his post at Verity, Steve spent four years as the chief information officer of Kootenai Health in Idaho, which is comprised of a hospital and 28 health clinics serving patients in northern Idaho, eastern Washington, Montana and the Inland Northwest. There he replaced the technology network, supported clinical integration for remote physicians and successfully attested to Meaningful Use Stages I and II for electronic health records, among other achievements. In addition, his team was bestowed with the Most Wired Innovators Award (2013), rated as the second best IT department in the U.S. by IT Healthcare News (2014) and designated as a Most Wired Hospital (2015). Previous to that, Steve served as the CIO of CHLA for nearly six years, during which time his team implemented the technology in the Marion & John E. Anderson Pavilion. Prior to working at CHLA, he served as the chief operating officer for Perot Systems and account executive of Computer Sciences Corporation. Steve holds a bachelor’s degree in applied mathematics, scientific programming from the University of California, San Diego, a master’s degree in business information technology from Kingston University in London, and a doctorate in applied management decision sciences and information systems management from Walden University. Steve has served on the boards of the University of Idaho’s College of Engineering, the Idaho Health Data Exchange and the North Idaho Health Network.